In May 2014 the spousal unit and I paid a visit to the Iowa kin en route from Nebraska back home. I was working a conference in Nebraska and it was a great opportunity to stop in, see family, and talk some genealogy. They were gracious enough to let me photograph and scan some items in their care that belonged to my Uncle Frank. I haven’t had a chance to write much about the Conwell side of my family because I’ve been concentrating my efforts on lesser-researched branches of my family and the spousal unit’s family. I think the Universe is trying to tell me to start writing about them. Rewinding to March 2014, I briefly wrote about Uncle Frank (who is technically my great-uncle) in Christmas Came Early in Genealogy-land when a gentleman from Oklahoma contacted me about some Conwell family items that had come into his possession. Several of these items belonged to Frank. So I devoted part of a blog post to the excitement of first contact but didn’t pursue writing about the Conwell side. During our visit the Iowa kin mentioned they planned to take some of Frank’s items to Bismarck, North Dakota where Antiques Roadshow was going to be filming. We thought that was pretty cool and shared their excitement about the trip but it didn’t really enter our mind that they would really make it on the show. But they did. So what did they take? They took items from Frank’s Naval career. 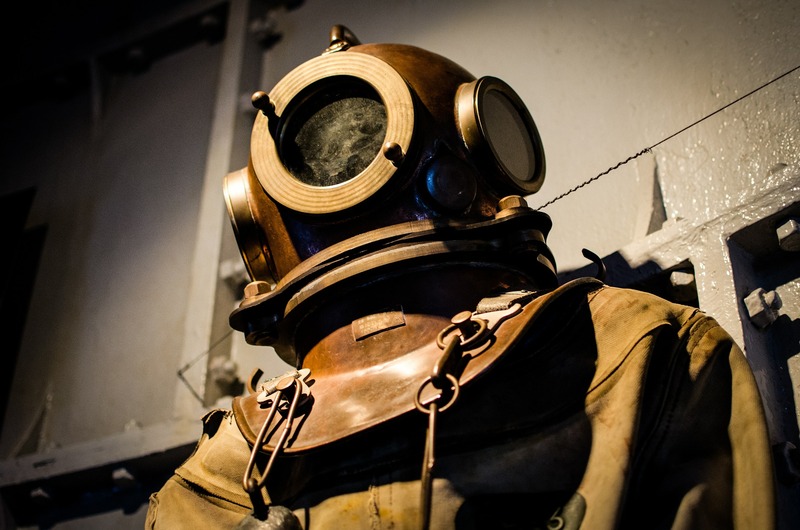 A very basic explanation of a salvage diver is a Naval diver who assists with any type of salvage operation. They also have other job duties like construction and demolition but Frank’s 10 minutes of fame related to his work in salvage. On May 23, 1939 the submarine U.S.S. Squalus set out on her final test dive. Her final dive began well but ended in disaster when she sunk with her crew aboard. In an unprecedented rescue, 33 of the crew who survived the initial disaster were rescued from the Squalus, which rested 240 feet below the surface. As with any heroic effort, there was a great deal of publicity about the rescue of the Squalus crew and the divers involved in the rescue operation. It was an effort worth the recognition it received. Much less publicized was the salvage of the Squalus after the crew’s rescue. This is the part of the diving operation Frank participated in. Diving in 1939 was a very dangerous activity. The environment was unpredictable and the equipment was cumbersome. Ascending to the surface too quickly meant serious medical complications for the diver. An incorrect move or calculation by a diver or sailors assisting the diver could mean an untimely end. So what does any of this have to do with Antiques Roadshow? Frank was awarded the Navy Cross for his participation in the salvage dive. His Navy Cross and citation along with a photo album of the salvage of the Squalus, a wooden carving of a diver (hand carved by Frank while on ship), and Good Conduct Medal were pieces of the collection which the Iowa kin took to the Antiques Roadshow taping. Frank never talked about his medals that I can remember. I don’t recall him mentioning the Squalus, nor do I remember him ever talking about having saved the life of a bystander watching the Squalus salvage operation but he made the newspaper for both of those acts. I heard about all of it from my grandfather. I also heard about the medical issues Frank had because of his diving activities from my grandfather. My uncle was a man who enjoyed the company of family and thought the world of my son, nicknaming him “The Boss” when he was just a toddler. I always equated him with the carvings which held real estate in my grandparents’, and then my parents’ homes. They’re absolutely gorgeous carvings and each one was hand carved by Frank while he was ship-bound. The episode of Antiques Roadshow featuring Frank’s items aired on February 16, 2015 and can be viewed here for you dear readers who are interested. A follow up article entitled “Saving the Squalus” was posted after the episode aired. The Universe’s final knock on the door came recently. A fellow researcher contacted me through Find A Grave asking if I was related to Frank. When she found out how I was related she generously offered to send me copies of the diving log from the Squalus rescue and salvage operations, which not only had entries made by Frank, but also contained his signature and an entry regarding his treatment in a decompression chamber. Frank was born 1 August 1912 in Kansas City, Jackson, Missouri to Edward Bell Conwell, Sr. and Zella May McCabe. He joined the Navy in 1931. During his time in the Navy he completed training for Carpenter’s Mate Second Class, Carpenter’s Mate First Class, Deep Sea Diving (attaining a dive depth of 300 feet in 1939), was awarded numerous swimming medals, a Good Conduct Medal, American Campaign Medal, Asiatic Pacific Campaign Medal, European African Middle Eastern Campaign Medal, Navy America Defense Service Medal and Naval Cross. He re-enlisted several times and obtained apprenticeship training as a plumber. Frank married Maybelle Victoria “Mabel” Boileau on the 19 November 1940 in Norwich, New London, Connecticut. They didn’t have any children together but Mabel brought one child into the marriage. Mabel died on the 27 May 1988 in Jamul, San Diego, California. Frank lived several more years and died on the 13 April 2001 in El Cahon, San Diego, California and is buried in Greenwood Memorial Park in San Diego, California. On my lengthy list of genealogical documents to obtain is Frank’s military service record. I’ve seen some of the photos he took while in service and am very curious where he sailed and what ships he served on. I also saw the Antiques Roadshow episode and wondered if I am related to Frank Russell Conwell. My father was John Byrnes Conwell from Chicago. His father was Samuel H. (Howard?) Conwell from Pennsylvania and, later, Chicago. Have you run across any links between your family and mine? No I haven’t but I haven’t done much research on collateral lines further back. My Conwells came through Ohio from Virginia. Who knows, we may be related further back!